While CHE106, a new course for non-science majors scheduled for the Fall, 2006 semester, will not turn students into the next great crime scene investigators, it will offer them a unique way to learn important biology and chemistry concepts. Developed by MCCC’s Laura Blinderman, associate professor in biology, and Helen Tanzini, assistant professor in chemistry, the forensics focus provides a mechanism to get students immersed in the subject matter. Creating the course as a general education science elective, the profs say that it lends itself well to the goals stated in the General Education policy, requiring oral and written presentations, Internet research and collaborative efforts. “The timing is so right,” said Tanzini. “So many students are interested in this area because of popular television shows.” Tanzini notes that the college has been very supportive, awarding her and Blinderman a mini-grant in the spring of 2004 to develop the course. 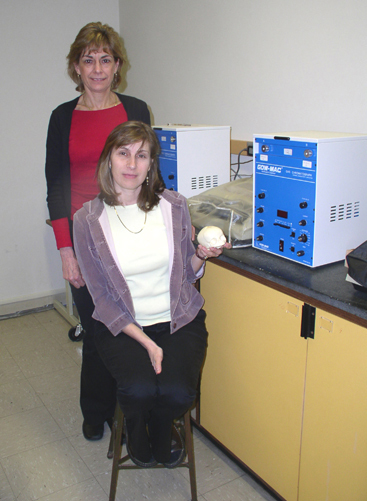 Helen Tanzini (left) and Laura Blinderman in the lab. In two hours of lecture and two hours of lab, the course will cover fundamentals in general, organic and biochemistry, and general and molecular biology, using modern lab instrumentation. Among the topics will be fingerprinting, DNA analysis, bone, tooth, and hair analysis, blood typing, and over-the-counter drug analysis. Students will analyze various substances using chromatography which provides a graph unique for each sample. There will be group projects and discussions, use of actual crime scene photos, and presentation of evidence based on real and hypothetical cases. Blinderman and Tanzini participate in Science Education for New Civic Engagement and Responsibilities (SENCER), an NSF-funded national project to create learning experiences that help students become civically engaged and develop a greater awareness of the world around them. They attended a five-day workshop in San Jose last summer with several other MCCC faculty members that promoted this concept. A field trip to the New Jersey State Crime Lab is planned for each semester. Guest speakers may include a forensic anthropologist and forensic entomologist who is a Mercer grad. The college has been very supportive of their effort. Tanzini and Blinderman were awarded a mini-grant to develop the course and received funding to purchase essential equipment such as skull models, skeletons from different ethnicities, slides of hair and skin types, supplies to prepare individual student slides; and sheep eyeballs and hearts, which are good for study since they closely resemble human organs. The course prerequisite is MAT 034; corequisite is ENG101.